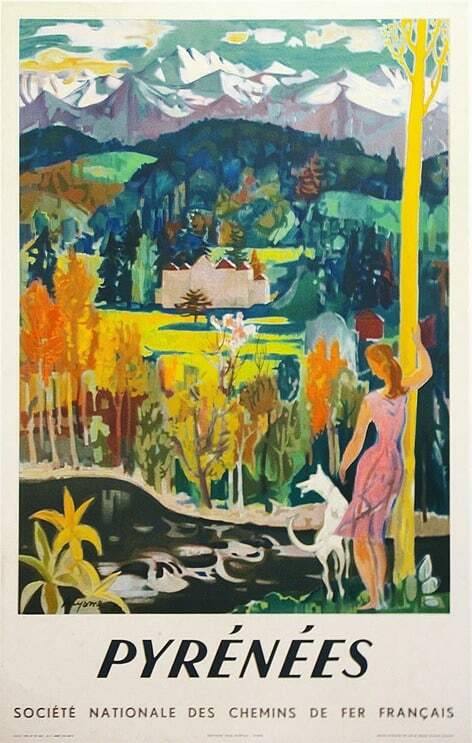 This is a Mid-Century Modern period French travel poster for SNCF (Société nationale des chemins de fer français), the French National Railway Company in the Pyrenees. The poster is simply but exquisitely crafted, and it features a large central image with text beneath it. The impressionist inspired image shows a woman standing with her dog, leaning against a tree looking out at a beautiful country mountain scene. It is filled with a soft but rich color palate, evoking the peacefulness of the Pyrenees.